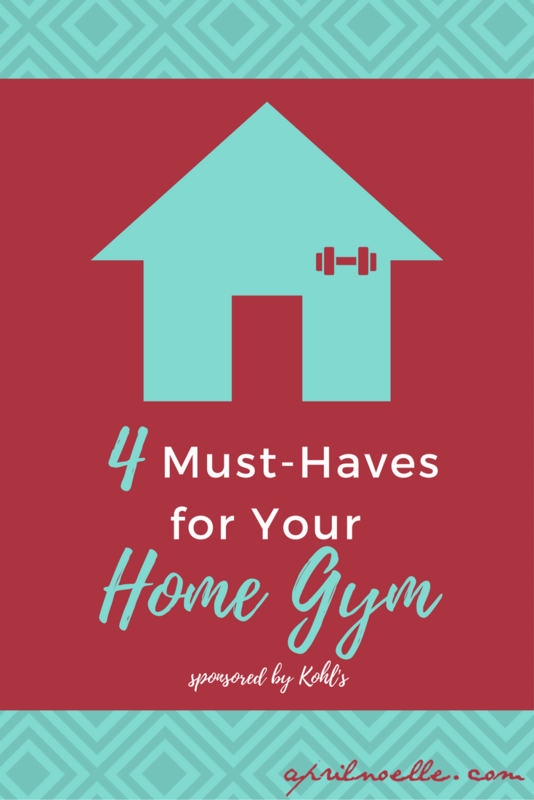 This post was sponsored by Kohl’s #MakeYourMove campaign to help you start your home gym. I was compensated for this post, but all opinions are my own. I know I’ve said it over and over again, I am working to get into shape. This last week, I lost 6.2 pounds! I know I won’t be able to sustain that type of progress (granted, I’m still keeping my fingers crossed and working hard), I could certainly use some help. So at the end of last year, I received some fitness equipment from Kohl’s to help me hit this goal. I love an elliptical. It is the backbone of my home gym. With the extra weight, I haven’t been able to really get on a treadmill for some time, and the elliptical gives me an excellent workout. Three times a week, I’ve been jumping on the ProForm Easy Strider! I can easily fit it in my living room because it has front mech ellipticals, which is awesome because it takes up a smaller footprint in the home compared to a rear mech ellipticals and is generally more aesthetically pleasing. This machine comes loaded with features that you would see in $799 price point elliptical; Inertia Enhanced Flywheel, SMR, Upper Body Grips, Transport Wheels, IPOD Compatible Audio, On-board 8 week weight loss programming & Workout Fan. I tend to have a lot of typing to do. Now, I don’t have to choose between whether I’m going to work out or just work. I moved the bike into my bedroom and whenever I need to work out while I work, I jump on for anywhere from 10 minutes to an hour. The ProForm Desk Bike allows you to stay active while you work if you so choose. The desk attaches and detaches very easily. If there is a knock on home fitness equipment, it is the space it takes up, this design has worked to solve that. Some additional cool features to look at are the Inertia Enhanced Flywheel, Over-sized Cushion Seat, Vertical Seat Adjustment, SMR Magnetic Resistance & Portability Wheels. I found my love for rowing when I started a new workout program last year. Whenever I saw rowing on the schedule, I would get as close to giddy as I can get, and get ready to race. I had to get one for my home gym as soon as I could. The rower works your back and your legs and I would always feel like I got a full-body workout even with rowing simply 500 or 1000 meters (less than 5 minutes). The Stamina Magnetic Rowing Machine fits easily in any corner. When it’s standing, takes up the size of less than a side table. After working out, relax and massage. I take the BackTrac Back Massager, lay down and meditate while slowing rolling across the massage elements. Each element provides acupressure to reduce trigger point tenderness, a deep massage to aid muscle function and to gently stretch your spine. This takes no time to set up or put away but keeps your body relaxed as a much-needed massager. In general fitness equipment takes some time to set up. ProForm has worked extremely hard to make this as smooth and easy as possible. I am now on a mission to hit my weight loss goals. This time around, it doesn’t hurt that my husband is in on the plan, so we’ve been alternating the use of the fitness equipment most evenings. Is working out part of your New Year’s Resolution? What are your plans? I have made it a goal this year to get a home gym going in my lower level. After reading this, I have to have that desk bike in my life! I so need this, I spend so much of my day sitting for work on the computer and this would help so much. Well, yes work out is part of my NY’s resolutions! But I wish I have gym equipment! haha lol! tho, even if I had, I have no time to do it regularly. So I started my health routine by healthy diet, and a jogging! This coming February my gym space at home will be finished and I’m so excited to workout then. One of my friends bought the bike desk. I think it’s a great way to get exercise while you work. Getting fit is all about your dedication to fitness and living healthy, it would be nice to setup a home gym so that you can work out any time at home! These are all great tips! I am not planning on losing more weight. I am happy at 95 lbs. I just want exercise regularly and eat healthily. I love Kohls so much! They have such wonderful things. I need an elliptical. I love that desk bike! And it’s cool that the rower folds up like that – so convenient for smaller spaces. My husband and I would love to have a gym at home. We’ve been trying to figure out a way to create some space for one! You have some cool equipment. We so love the desk/bike. Thats a brilliant idea. I really like the elliptical as it’s a lot easier on the knees than a treadmill. I wish I could afford one but they are pretty expensive. The Easy Strider looks like a good option though as it is a lot smaller and less expensive. Great selection for home gym equipment. That elliptical, I can sure use that one. The pro bike is another great suggestion. Already I can see myself doing working on my laptop while burning calories away. That’s great that you’ve been able to incorporate working out and working into your routine! I go to the local YMCA since I have 2 kiddos at home. This allows for me to workout while they are having fun in KidZone (daycare, free with my membership). I have been trying to get there 3-5x a week so far this year and look forward to working on losing 20-40lbs this year! Ellipticals are so great! Congrats on your great progress over the past week. I’m adding weights to my workout routine this year since I’ve always relied so much on cardio for fitness. But one of my resolutions is to get stronger this year! This is perfect timing. I just quit my gym because my husband is making me a gym at home. I’ve read so many blogs on having a home gym and this is the most comprehensive. I love the cycle that I can also work on, I could be on that all day! Thank you for helping! I want one of those laptop working bikes!! I sit at work, then sit at home to work, so I LOVE this! Love this! Kohl’s is seriously the best so it makes it even better. I want a home gym so bad! I would love to have all of this at my disposal in my home. I really want a home gym one day! I would love a desk bike how cool would that be. Never having to leave your house and being able to work while exercising…happy days! You’re on the right track to reach your weight loss goals. Kohl’s makes a home gym doable on a budget. I love the elliptical machine. That really is ny favorite one. I will have to check it out next time I am at kohls. Working on my home gym too! Thanks for these awesome tips! I hear more and more from my work from home friends about their bike desk – going to have to look into it! Good for you, darling, you’ve got this! I’m sending you and hubby the best vibes on your health journeys! I just got a treadmill, but I really want a bike! It would be great to exercise with a low-impact machine. I’ve never tried setting up a home gym before. This sounds about right though, you need to have all the right equipment. I think a personal mission is so important! Goals are what drive my day to day most times! I got rid of my treadmill and got an elliptical. Its ok, but I really miss my treadmill because I could walk or run. We used to have an elliptical, and it was easy on the knees. Thanks for all this great info! My wife and I love Kohls! I workout at the gym. My home fitness items consist of anything less then cardio equipment. I use all of the machines you stated and would love to have one or some at home but space would be an issue. Unless they could fold down enough to fit somewhere even under the bed. Oooh the BackTrac Back Massager sounds like something I could totally use! I also love the ProForm Desk Bike, Lord knows I need to get more exercise! I do want a home gym of my own, but it’s probably only possible after we buy a new place! These exercise equipments sound really convenient and effective for keeping in shape! Will bear them in mind when I set up a home gym of my own in the future! The elliptical is my favourite machine! I always go for it when I go to the gym! These all sound interesting to have in an at home gym. I would love to have an elliptical at home. Good luck with your weight loss goals. Your opinions are very interesting, it makes my life better. In the gym, I think there should be appropriate music.